After delays in delivery by primary GPS III contractor Lockheed Martin Space Systems, the US Air Force is now officially shopping for alternative companies to provide the remaining 22 spacecraft designed to make up the next generation SATCOM constellation. Photo: courtesy Lockheed Martin Space Systems. According to Space News, Lockheed Martin (LM) will honor its contract to deliver and maintain the first eight GPS III satellites, but the USAF has opened up the rest for bid. Difficulties with the payload and navigation systems for the first batch of satellites have left LM with three space vehicles ready to fly, but without a nav payload signal to put aboard them. Subcontractor Exelis is responsible for that, and LM has pinned the delays on them. Delivery delays have prompted the Air Force to seek alternatives. In June 2014, the USAF issued an official “sources sought” notice, for “a production-ready GPS space vehicle, equipped with an alternate payload,” in addition to the Lockheed Martin-built GPS III vehicles. The first phase of the contract would include two firm-fixed price contracts worth $100–$200 million to demonstrate a competitor to GPS III. According to Space News, Boeing and Northrop Grumman have responded to the “sources sought” call. The company has already received $1.4 billion for production of the first four satellites at its Waterton Canyon facility. Some of the key requirements of the new solicitation are that the satellite must offer a payload alternative to the problematical one built by Exelis; the satellite must be ready to launch by 2023; and the production line must be able to turn out two to three new satellites per year. The final contract award will be made in 2017 or 2018. 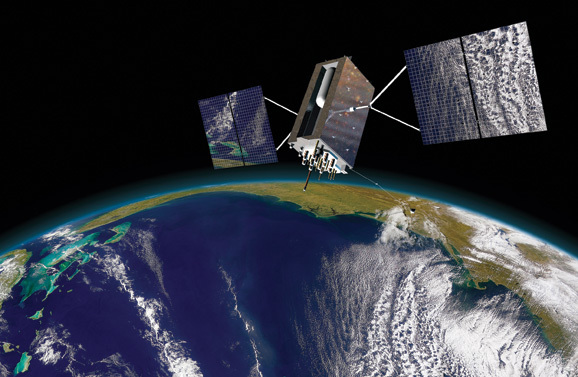 The GPS III is the next generation of the US government’s GPS system, and will be used not only by the military, but civilian and commercial applications worldwide. It is expected to deliver three times as much accuracy, up to eight times as much power and is anticipated to provide users around the globe with significantly improved coverage in hard to reach areas than the current GPS constellation.